I have been inspired by a very nice video of our hobby-colleague Arnulf das Schandmaul to write a post for all those people wanting to see the few medieval buildings and findings in museums which can be discovered in Vienna. Unfortunately Vienna seems not to have a large passion for medieval history, the Viennese inhabitants are appearantly more into antique and imperial history. But with a little time spent, there are a lot of things to discover in Vienna. Please also see our tips for sights in Vienna’s outskirts. Wien Museum am Karlsplatz: THE museum you need to see in Vienna if you are interested in medieval history. The collection is small but well worth seeing and the shop of the museum is well equipped. The Wien Museum also manages the Virgilkapelle below the Metro Station Stephansplatz, a jewel of medieval builders craft and including a small museum of local finds. 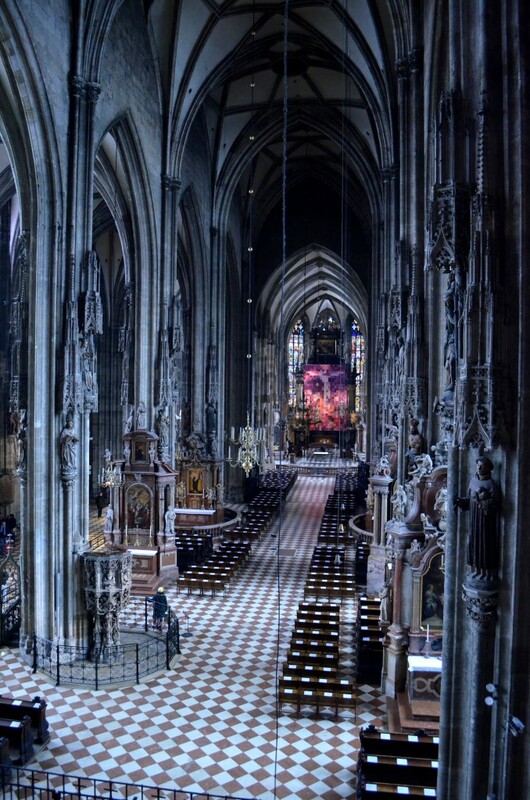 While you are near Stephansdom, you should definitely visit it for a view of gothic architecture and sculpture. Especially nice are the beautiful glass windows in the area of the altar and the statues on the fassade of the church. A tour of the catacombs or the towers is recommendable as well. Closeby you can find the treasury of the Deutscher Orden, which can offer some neat precious originals. A small but good collection of paintings from the 15th century as well as sculptures from high to late medieval can be found in the Prunkstall of Belvedere palace, which is always worth a visit, also for its more modern art pieces. Unfortunately it is strictly forbidden to take photos and the shop of the museum is not well equipped with literature about the medieval collection. In the inner city district, tucked away in the narrow streets, you will find Maria am Gestade, a small church which is mostly featuring neo-gothic fassades but originally gothic interior and sculptures. In the Michaelerkirche church, next to Hofburg Palace, original frescoes can be found in the right and back part of the church. Minoritenkirche church behind the Burgtheater is unfortunately only original in parts, yet has an intriguing sandstone fassade. One of the best medieval treasures of Vienna are the Neidhart frescoes in Tuchlauben street. They are the best preserved medieval frescoes in Vienna, comissioned by a rich tradesman for his grand hall which makes them unique between mostly ecclesiastical frescoes preserved in Austria. Speaking of treasures… not only fans of medieval history will enjoy the Kunstkammer in the Kunsthistorisches Museum Wien. The medieval treasures in this collection are statues, chess boards, boxes etc. Unfortunately they are only the smallest part of the collection, but the Kunstkammer is definitely a Must-see in Vienna, seeking it’s equal all around the world. Bring time, the tour can not be done in 30 minutes ;-) The ticket also includes the other parts of the Kunsthistorisches Museum, which are well worth the visit. The paintings from early Renaissance and a well equipped antique collection. For the gentlemen, the Hofjagd- und Rüstkammer in the newer part of the Hofburg is a must!! Few medieval pieces can be found in the kaiserliche Schatzkammer in the Hofburg palace. Expect jewels, gold and some nice religious treasures. In the Naturhistorisches Museum (Room 12) you can find very nice finds from the early medieval period, the museum is always well worth a visit! A secret tip which you will not find in the guidebook, is the staircase of the Steigenberger Hotel Herrenhof (rear part of the building) in the Herrengasse near Hofburg, where you find several showcases containing medieval ceramics. Across the street in the Palais Niederösterreich, further ceramics are displayed within their house. The medieval cross coat which is unfortunately not opened daily is hidden in the dominican monastery of the church Maria Rotunda, where some of the medieval frescoes have been preserved. When going for a walk, try to pass by the Griechenbeisl tavern, inhabited in a gothic tower-building. Good food and cellars from the 11th century can be found at Augustinerkeller tavern. At the Freyung, original cobblestone from the 12th century has been left unchanged until today. In the Heiligenkreuzerhof in the first district, a small piece of medieval murals has been left open. The fundaments of the Viennese city walls can be seen in the Metro Station Stubentor and next to St Ruprechtschurch near Schwedenplatz, which also holds some medieval walls and artworks. Überweitere Tipps freue ich mich natürlich sehr, vielleicht wisst ihr ja sogar noch etwas, das ich noch nicht kenne?